Ned Andrew Solomon’s first creative outlet was music. 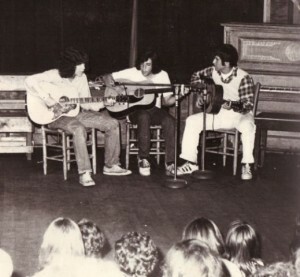 A member of the Balladeers at Camp Taconic in the early 1970s, Ned was writing original compositions on his guitar before he was driving — one of which is even archived in the Smithsonian. In the 1980s, his bands No Mercy, Poetic Justice, and Economy – which featured his original compositions – performed at several Baltimore live music venues. In 1988, Ned moved to Nashville, TN to pursue a career as a songwriter. A regular at venues in and around Nashville, including the landmark Bluebird Cafe, he gained a dedicated following. As fortune would have it, a smaller audience at home needed his attention, and he put away his guitar for more steady work. After nearly a decade, Ned Andrew has rekindled his affair with his 1971 Martin at the urging of his wife, Gina Lynette, and his friends, co-writers and former band members. 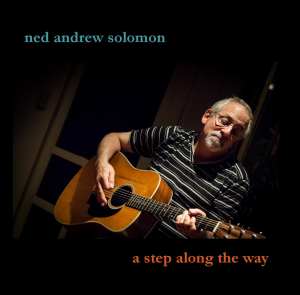 After more than four decades of singing and playing and composing, Ned Andrew has finally released his first album, A Step Along the Way. Through the month of October, it is available here.